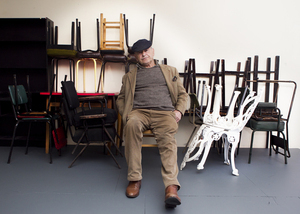 “The importance of Tom Murphy’s contribution to Irish theatre is immeasurable and outstanding. We have had no greater use of language for the stage than in the body of work produced by Tom Murphy since his earliest work in the 1960s. His themes were not only those which had influenced the very essence of Irishness, immigration, famine and loss – they were universal in their reach. President Michael D Higgins this morning. Posted in Misc and tagged Theatre, Tom Murphy at 9:51 am on May 16, 2018 by Bodger. The Gigli concert might be the best performance I’ve ever seen on a stage. No, it was a much earlier production than that. I want to say late 80’s early 90s? I’ve never seen the Sanctuary Lamp, Must have a look next time its running. Did you see the Druid production at the Galway arts festival circa 2009? I was sickened to have missed it. Sold out in two shakes of a lamb’s tail. The Gigli Concert is brilliant. A beautiful mind. RIP. I love Conversations of a Homecoming. Captures the rural pubs I visit with my Dad perfectly. Loud bursts of laughter, long silences, people saying nothing but saying everything. it’s the Irish psyche, witty and social and quietly mournful. It definitely influenced The Weir. Did anyone see Tom Murphy in the documentary about Ivor Browne? I had mixed feelings about seeing such a powerful, sharp, charismatic man feebled by age. It will happen to us all of course but it was difficult to watch. I’m not sure, had I been in Alan Gilsenan’s shoes, that I would have included it.